A few things can make all the difference when showing over fences. Just remember: ‘’PACE – PATH – POSITION. ’’ The ‘PACE’ should be a nice open 12 foot cantering stride that maintains a consistent rhythm . Test your horses stride length by riding over set distances between jumps. Horses showing in the hunter classes will need to maintain 12 foot strides plus take a 6 foot take off and landing over the jumps . So you should be able to get five strides cantering between two jumps set at 72 feet apart and two strides in a 36 foot combination. If you need to gallop on a bit to make the distances, practice this until it feels smooth. But , if you find you need to gallop too fast to make those distances , you will ruin the nice relaxed hunter look and it can also be dangerous! So if your horse does not have a big enough stride, you can still show him to his best advantage by slowing down and adding one stride in each longer line of jumps. However, you must still make the correct number of strides in the combinations. Then remember ‘PATH ‘. The Path will be the lines you take while riding to the jumps and around the corners of the arena. The more you plan this part of your course the better everything else will work out ! 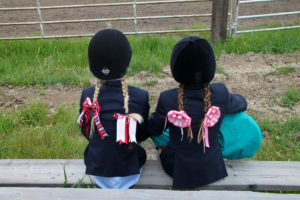 A horse that is ridden correctly around the corners in rhythm , will have a better chance of approaching the fences straight and jumping in balance. 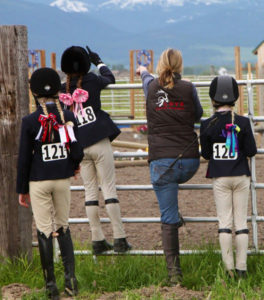 This is the core of a well ridden hunter and equitation course! Plan to ride out a bit farther on your PATH than you would think is necessary. 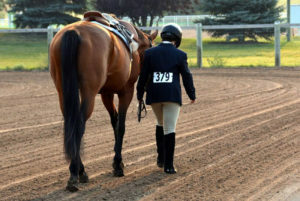 A galloping horse has the tendency to lean in on the turns, and this will cut the corners too short and can make mistakes happen at the next jump. A horse that will steer nicely out to the corners, is also a horse that is listening to the rider, so that will present a nicer picture too! Have a nice round opening and ending circle as you begin and end your course. Remember every stride is an important part of the performance! Be sure to ride an arrow straight PATH right to the middle of the jumps and on the lines between them. This is best accomplished by looking up and finding focal points ahead of you in the arena! Look for this focal point before you begin the ride around the corners to the next line of fences. Keeping your eyes and head up is also part of the last reminder: ‘ POSTITON’ . 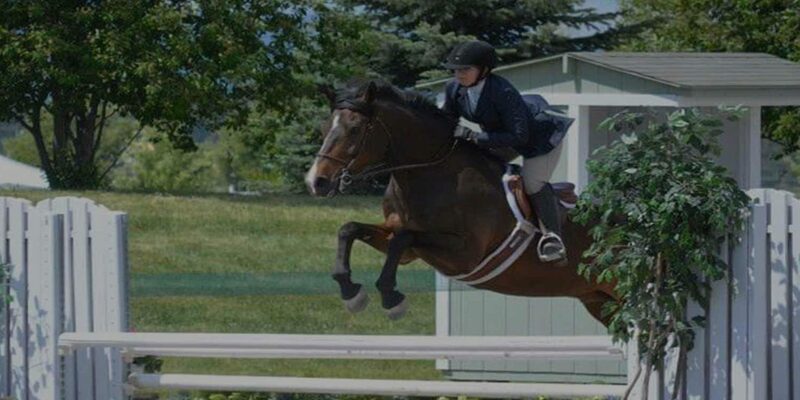 A hunter rider who stays in a quiet position does a better job of showing off their horse ! Try to maintain a nice 2 point position, with eyes up , hands low and a tight leg position with heels down. This will draw attention to the horses jumping efforts and not to the movement of the rider. Have Fun and see you at the next show!